When an author decides to publish their own book, there are many questions to be answered. It’s the first of these questions about self-publishing I want to address in this article, and that has to do with starting a publishing company. Some authors will decide to simply print copies of their book for their own use, or as gifts, or to sell occasionally at private readings or meetings. This type of publishing can be done by an individual without any need for a company structure. It’s when you decide to approach publishing as a business with the intention to market your books to the wider world, list them on online retailers like Amazon.com, try to get them into bookstores, and essentially to become a competitive publisher, that’s when you need to set up a company if you don’t have one already. Some new self-publishers won’t need to start a new business, since they already have a business structure of some kind. Consultants, therapists, and free lance writers, for instance—all candidates for self-publishing—usually do business as a company, and can publish their books in the same way they do the rest of their business. Sole proprietorship—The simplest business model, an operation controlled by you alone. Corporation—A commercial entity is created in which you and others hold shares. Most complex business structure. Partnership—A contractual relationship in which two or more people exercise control of the company. 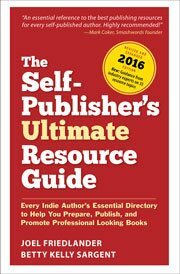 Most new self-publishers will undoubtedly decide to be sole proprietors. You pick a name and conduct a search in the county records, and the state records, to see whether anyone else is operating under that name. In the end you receive a document certifying that you are operating under the name. In my case, I went through this process when I first started Marin Bookworks. The advantage is that now you can go to a bank and establish a relationship with the bank as a business. This will come in handy as your company matures and has need for more banking or financial services. Decide whether you want to use your home address, or the address of a postal-services company like UPS Stores as your business address. First stop to getting set up in the book publishing industry is to buy your ISBNs. This is the beginning of introducing your company to Bowker, keeper of the basic bibliographic resources in publishing, as well as the ISBN provider and administrator for the United States. These ISBNs will identify your books but, more important, will identify your company as the publisher. Go to RR Bowker’s MyIdentifiers.com website and pick one of the packages. Single ISBN, $125.00—Bowker advertises this as a good deal for self-publishers, but it looks expensive to me. Single ISBN with bar code, $150.00—This is also advertised as great for self-publishers, but savvy self-publishers know that printers like Lightning Source and publisher-service companies like CreateSpace will provide you with a bar code of your book’s ISBN automatically and at no charge. Keep looking. Blocks of 10 ISBNs, $325.00—We have to live with these charges for numbers, so this is your best deal for almost all self-publishers. If you thought you were going to be doing a lot of shipping from your location, you could also purchase a Standard Address Number (SAN) at Bowker, but you can wait on this until your printing and distribution options have been clarified. Armed with your new business name and business bank account, you’re ready to finish your introductions. Bowker provides the Bowkerlink.com tool for publishers. * Books In Print® and Global Books In Print® websites have over 3000 subscribers including retailers, libraries and publishers. * Bowker has over 1800 library customers including The New York Public Library, Harvard University Library, and the British Library. Including branch libraries, over 5000 different locations can access your data. * Over 60 booksellers access your data. Barnes & Noble, Borders, and Follett are among the major retail customers for Bowker’s data. * School systems are a growth market for Bowker and the New York Department of Education is a leading school user of Books In Print information. Your data is circulated to all of these customers free of charge and there is no cost for submitting data to Bowker. You’ll want to register for a free account and fill out all the approriate fields to register. One of the great resources of BowkerLink is access to the Title Information Record for each of your books. This is where you will fill out the details of your book once you’ve settled on title, subtitle, and all the edition and pricing information that will complete the record. When you complete the Title Information for Bowker, your book will automatically be entered in their system, and recoverable with the unique ISBN that you assign to it. You won’t have the information yet to complete the entire Bowkerlink publisher profile, since you don’t have distributors, discount terms, or a host of other information that will eventually become part of this record. That’s okay, you will be coming back here soon enough. You’ve now established your company in the records of the publishing business. Any book you publish with the ISBNs you purchased will be traced back to you and your contact information that you provided. It’s a good idea to keep all these records up to date. And here’s why it’s worth doing all this: Many successful self-publishers realize that it’s much easier to publish their second, third, and fourth books, particularly in the same niche as their first book. This is how a publishing company can become a real business. Do you mind if I quote a couple of your posts as long as I provide credit and sources back to your site? My blog site is in the very same area of interest as yours and my visitors would really benefit from some of the information you provide here. Please let me know if this okay with you. Thank you! What if an existing company would also like to make publishing a part of what they do? No problem, Amy. If you have an existing business of some kind you can use that. Your publishing activities can be one “division” of the larger company. This works best, of course, if the books you’ll be publishing are in the same field that your company operates within. Thank you for the insights. You are right, writers who are not yet published authors are intimidated and overwhelmed by the publishing gauntlet. I know I am. I am a DIY. I even took courses in community college to design my own book covers. I chickened out of self publishing when the market crashed and my liquidity disappeared. I am a writer. I am also an artist. I am not a business person. I am scared half to death to try this self publication venture but there comes a time when you have to make up your mind do you want to share the work or not. If you do you have to take action. Not making the decision is to deside. I am interested, due to self preservation issues, in establishing a LLC and a nome de plume. Did you cover those topics in previous articles or are you going to do so in the future? Joel’s article about starting a publishing company was informative. I started a company about 6 months ago. I went on the internet and learned what was out there in the way of information needed. I spent many hours researching. I chose my company name and then checked with the government on trade names, etc. to find if any other outfit was already using the name. No one was so I was good to go. I discovered Bowker and jumped on board. As soon as I registered with Bowker and subsequently purchased a bank of 10 ISBN’s (at $25 each) I received a card in the mail from a printing company in St. Louis fishing for my business. Wow! Bowker is quick! Great information; concise and easy to understand. This will come in handy in the near future. I posted a question yesterday regarding choosing a publishing name. Since that time, I have read your article on how to Create, Register, and List your new publishing company. I was wondering how this would apply to me, since I am temporarily living in P.R. China, just across from Hong Kong. My husband is working in an international school here. I have a friend in the U.S. who has offered to be the distributor of my books, and I plan to ship books from China to the U.S. Should I use my friend’s company as the publisher? He has a consulting company. Or, can I authorize my sister in the States (with power of attorney) to help me register a publishing company? This article was very helpful! Thank you! Leanne, thanks. Bowker has licensed several associates to sell single ISBNs due to the explosion of interest in self-publishing. For 10 packs and up, I believe you still have to go to Bowker. And one thing you quickly learn as a self-publisher is that you need to have some grasp of the entire business! Thanks for the quick yet thorough overview. Even with my background at a press that published 40-60 books a year, I didn’t know how some of this works because it wasn’t a key part of my job. Are there any other sources for ISBNs in small numbers? Or is Bowker The Place to get these? Michael, thanks for your comment. Yes, LLC has definite advantages. My own publishing company was a Subchapter S Corp. which worked well for the partnership involved. Good luck with your new blog! Great post. One more option to consider for setting up a business would be an LLC. With an LLC you have the legal protection of a corporation and the tax advantage of a partnership. Thanks Christy! One of the references I looked over for this article was your The Step-by-Step Guide to Self-Publishing for Profit! because you have the best business and tax info (from what I’ve seen) of all the self-publishing books. Great Post! I re-tweeted. I love the info about BowkerLink.